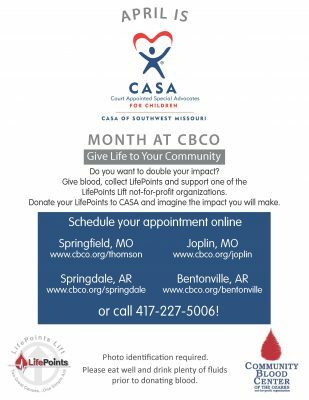 April 2017 is CASA month at Community Blood Center of the Ozarks! It’s a great way to help two non-profits at the same time — CBCO with your lifesaving gift of blood and CASA with your LifePoints which allows the organization to help abused and neglected children in foster care. You’ll receive LifePoints for your donations all year round, and you can give your LifePoints to one of our agency partners at any time. Not just in April. But April is our time to share information about CASA . CASA of Southwest Missouri was created in 1988 by concerned community members and judges following the creation of the national CASA model by a Seattle family court judge in 1977. CASA is part of the solution for abused and neglected children in foster care. Finding a safe permanent home is not simply a CASA volunteer’s vision for every abused child but it is their paramount objective. CASA is an intervention and prevention program – working to prevent future incidence of abuse and protecting siblings from similar experiences by assisting child welfare professionals and acting as “the eyes and ears” of the Juvenile court judge. CASA has a proven record of success. Children who have a CASA volunteer spend an average of a year less in the foster care system. Children represented by a CASA volunteer are given a voice: someone who investigates, makes recommendations on their behalf, advocates for services in an environment of scarce resources and challenges the system to do what it is suppose to do for each child. There are no easy answers. It takes time to understand the situation, time to talk to everyone involved, time to find out if it is an isolated incident or an ongoing pattern, time to listen, time to observe and time to understand. CASA volunteers thoroughly investigate the circumstances of each case by reading the Juvenile Court files and visiting the child in foster care, the natural parents, relatives, teachers, day-care workers, therapists and others with relevant information about the child. They make monthly reports and attend meetings and court hearings for their child. Currently more than 900 children are in foster care in Greene County. Because of the shortage of foster homes here our children are placed in 59 counties and 12 different states. CASA of Southwest Missouri is a private, nonprofit organization that recruits, trains and supports community volunteers who assist the court in protecting the best interests of abused and neglected children in Southwest Missouri. A Court Appointed Special Advocate (CASA) volunteer is a specially-trained citizen appointed by the Juvenile Court judge to represent a child victim in cases of abuse and neglect. A CASA’s role in abuse and neglect proceedings is to present the court with a unique “child-centered” perspective regarding what is in the best interest of the child. Founded in 1995, CBCO has grown to serve 40 counties in three states and is the sole supplier of blood and blood products to 40 hospitals in southwest Missouri, northwest Arkansas, and southeast Kansas (as of 3/1/17).